Jim was born in 1929 and entered the US Air Force upon graduation from the US Naval Academy in 1952. Following pilot training, including helicopter school, his assignments included a brief tour in the Marshall Islands for nuclear weapons tests, and a tour in Goose Bay, Labrador where he said his helicopter carried everything from a downed fighter pilot to local natives needing medical care (along with their cooking pots on occasion!). After his DC assignment, Jim was selected to attend the Air Force Experimental Test Pilot School. 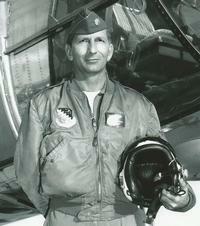 He graduated in 1959 and was assigned to the helicopter section of Flight Test Operations. His time there was interrupted by a tour in Vietnam 1965-1966. His years in the Air Force gave him the opportunity to fly many different aircraft. He had many exciting moments – witnessing a nuclear bomb test, landing a helicopter on the White House lawn (practice run), and testing the Canadair CL-84 tiltwing, as well as successfully bailing out of a helicopter when a test flight went bad. Upon retirement, he went to work for the Federal Aviation Administration (FAA) in Texas. Jim Honaker passed away in September 2013. He originally joined AHS in 1960 and was an Emeritus Member.